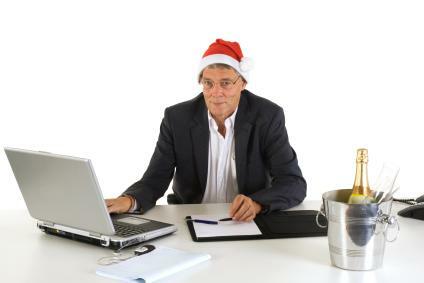 The company Christmas party is a beloved tradition in many businesses, but it can also be the subject of much debate. Consider the following advantages and disadvantages before planning your next holiday event. A company Christmas party can be seen as a 'thank you' for the past year's work. The party may be planned in conjunction with employee Christmas gifts or held in place of giving individual presents. Employees from all levels of the company come together for the big Christmas party. This gives everyone a rare chance to mingle across department lines and job descriptions. Attendees can take advantage of this chance to network, make helpful connections, and get their name known. A party allows employees to get to know each other outside of the business setting. Talking around the dinner table can lead to improved relationships in everyday work. Inviting your clients to the company Christmas party shows your appreciation of their business. This isn't the place for business deals, but a few minutes of conversation in a casual setting can lead to more contracts in the coming year. If a company is facing cutbacks and layoffs, it can seem frivolous, or even insulting to those losing their jobs, to hold a spare-no-expense holiday extravaganza. Even smaller events can cut into the company budget. Is a party really the best use of a company's money? While alcohol seems to be an integral part of many company Christmas parties, it can lead to unfortunate situations. From a business standpoint, one of the most troubling aspects is the potential for liability if an employee is injured or causes injury due to being intoxicated. Businesses should look into purchasing a liquor liability insurance policy to guard against lawsuits. Even though a company Christmas party occurs after-hours, it is still a business event calling for proper conduct. Unfortunately, too many people forget this once the drinks start flowing. Whether they get a little too friendly with a co-worker or tell off their boss, the indiscretions of Saturday night will come back to haunt them on Monday morning. There are a few steps companies can take to minimize the impact of serving alcohol. A cash bar can keep the alcohol from flowing too freely while also decreasing the celebration's budget. Make sure those serving alcohol are trained professionals who know when to stop serving an inebriated guest. Also keep in mind how people will get home after the party to minimize the potential for drunk driving. Plan your event near public transportation, if possible, and have cabs and designated drivers available. The annual Christmas party can become such a tradition that it's easy to overlook the fact that not every employee celebrates Christmas, and some may be uncomfortable at a Christmas celebration. Yet they still may feel compelled to attend the event to show they are "team players". While many people of other faiths can accept attending a secular holiday party, business owners should at least keep this fact in mind while planning the event. A successful event takes hours of planning. You must reserve a location, hire a caterer, plan the menu, find entertainment, decide on decorations, and take care of dozens of details. While you can leave the planning of your company Christmas party to staff members, can you really spare the lost productivity in the weeks before Christmas? Hire a professional event planner to free up time in the office and take the stress off your employees.